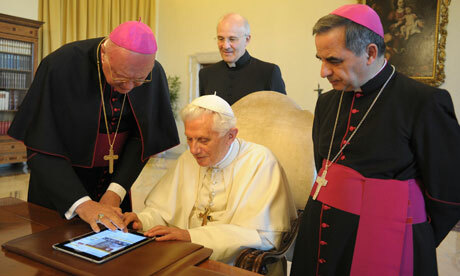 The Pope is on Twitter...and We Think That’s Awesome! Monday mornings in the OneDesk office are probably just like any typical mornings in any other office. We greet each other with stories of what we did over the weekend, and express how they are always too short. As the coffee brews, we go on to make comments about the weather, celebrities and interesting news stories. While getting settled at my desk, I quickly scrolled through my Twitter stream and as usual, started looking to see if there were any interesting ones to read out loud. All jokes aside, we think it’s awesome that the Pope has joined Twitter. And we are not the only ones! The Pope officially starts tweeting on December 12th, but a quick look at his Twitter account, @Pontifex, shows that he already has 197 667 followers (and that number is increasing by the minute). 1. Faithful followers of the Pope can now actually follow him. The Pope can now be connected to all his followers all the time. This can be compared to any company-customer relationship. In every company-customer relationship, customers want to be able to connect with the companies they feel strongly about all the time, and companies want to do their best to preach their knowledge, updates and news to customers. By joining Twitter, the Pope now has the ability to tweet his most important words of wisdom to the people who care about them most. The Pope is using social media. On top of that, he has invited Christians “to join the network of relationships which the digital era has made possible.” This shows that if even the Pope believes that social media offers Christians “a great opportunity to connect,” as stated by CSmonitor.com, there is no reason everyone else shouldn’t believe that. The Vatican already has a YouTube Channel and a Pope2You website which they use to increase awareness of their preachings. Move over Bible. The Pope is now on Twitter, on which he will tell the world about his latest thoughts and preach his wise words. Faithful followers of the Christian faith now have an online reference point for these lessons. It also gives the Vatican and the whole Catholic community more credibility since Christians are now getting information and advice of the Pope himself, and not some book that’s over 2000 years old. Ok, so the Pope didn’t create the Earth. But his prayers and lessons are all his creations, specifically aimed at the audience he is dealing with. He has prayers for the poor, for disabled, for the elderly, and he has them in several languages. With Twitter, he can make decisions about what to preach, based on what his followers are saying, the same way companies should listen to customers on social media and get ideas for their products. Altogether, there are billions of members of the Catholic Church who keep abreast of what is going on in the Vatican. Currently, whenever they out important notices, they do so in multiple-languages. The adoption of Twitter accounts in eight different languages show that the Pope will be Tweeting in more than one language in order to communicate his preachings around the world. This will save the Vatican a lot of time when communicating short messages. On top of that, receivers will be assured that the message is from the Pope himself, and not some Vatican intern. If you could ask the Pope anything, in 140 characters or less, what would you ask?